Win-It-Wednesday: Cybele’s Free-To-Eat Cookies – Free of Gluten and the TOP 8 Allergens! Finding a cookie that is gluten-free and free of the top 8 allergens can be tough. Throw into the quest a cookie that tastes good, and the hunt becomes almost impossible. But thanks to Cybele’s Free-To-Eat Cookies everyone on a gluten-free diet or those that are concerned with the top 8 allergens – Dairy, Eggs, Wheat, Soy, Peanuts, Tree Nuts, Fish and Shellfish – can enjoy a delicious, soft and sweet treat … worry free. These cookies are made by a mom of a food allergic family, Cybele Pascal (on a side note… Cybele is a remarkable woman! Make sure you check out Cybele’s blog for some delicious recipes and her “Allergen-Free Bakers Handbook” cookbook for some great allergen-free baking tips and recipes!) The cookies are also vegan – and come in four flavors: Chocolate Chunk Brownie, Chocolate Chip, Oatmeal Raisin, and my favorite, SnickerDoodle. Cybele’s Cookies are also baked in a dedicated gluten-free and allergy-friendly facility. O.K. – I know by now many of you are also thinking that these cookies must be free of flavor too. But, a-ha, you are wrong my friends. These cookies are soft (like, really, really soft… which I love), moist, full of raisins, chocolate chips & chunks and all the other fixins’. 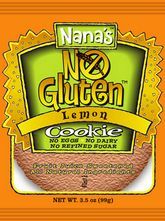 So they are a perfect worry-free, tasty treat for those on a gluten-free diet, celiac disease, or with food allergies. But beware! The non-gluten-free and non-food-allergic peeps in your household will be gobbling them up too… they are just that good. 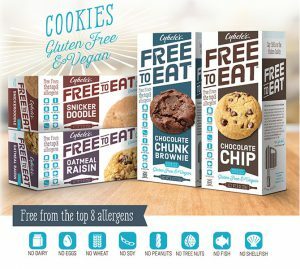 For being able to enjoy a super tasty cookie that is worry free when it comes to gluten and allergens, is the reason why I am so very excited to have Cybele’s Free-To-Eat Cookies as the prize for this Win-It-Wednesday on BeFreeForMe.com. Two (2) lucky winners will each receive a box of Cybele’s Free To Eat Cookies. One (1) winner will be randomly selected from all comments/entries received before Tuesday, May 9, 2017at 11:59 PM (EST) and one (1) more winner will be randomly selected from all comments/entries received between Wednesday, May 10 and Tuesday, May 16, 2017. So make sure you enter TWO TIMES to win! P.S. – Join me and connect with Cybele on Facebook and Twitter! This week’s WIN-It-Wednesday on BeFreeForMe.com is one of my favorite gluten-free cookie companies that is founded by one smart cookie herself, Dr. Lucy Gibney. Lucy’s is founded by a doctor that got down to some serious medical research – in the kitchen – because her child had severe food allergies. What began as a mother’s tasty recipe for her child has developed into a delicious alternative for people with (or even without!) special dietary considerations. 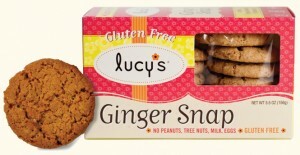 Not only are Lucy’s Cookies gluten-free, they are also free of peanuts, tree nuts, milk and eggs. They are also vegan. And even though Lucy’s Cookies are free of gluten and other common allergens, they aren’t missing out on flavor and tastiness. They are full of crunchy, airy cookie goodness, that makes them perfect for old-school milk dipping or classic ice cream sandwiches. 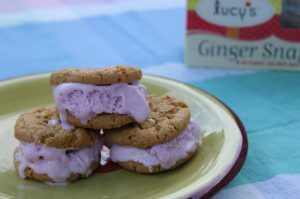 My most recent craveable dessert is sandwiching one of my favorite ice cream flavors, Black Raspberry, between two of Lucy’s Ginger Snap cookies. The spiciness of the cookies and the berry-creaminess of the ice cream is a match made in gluten-free heaven. And with only 120 calorie for three (YES 3!) cookies, 0 mg cholesterol, and 0 g tans fat – my most recent favorite dessert is even sweeter! The flavors of Lucy’s cookies goes beyond the ordinary too. As well as toting a bake sheet of traditional favorites, Lucy’s also offers some tantalizing flavors for the adult palate. Some include Ginger Snap, Maple Bliss, and Chocolate – as well as Oatmeal, Chocolate Chip, Cinnamon Thin and Sugar. A total of two(2) BeFreeForMe members will be selected to win a two-pack of Lucy’s Cookies. One winners will be randomly selected from the entries received before Tuesday, October 25, 2016 at 11:59 PM EST, and one more winners will be randomly selected to win from the entries received between Wednesday, October 26 and Tuesday, November 1, 2016 at 11:59 PM. SO – make sure you enter to win two times! Friday Favorite: Ian’s Chocolate Chip Cookie Buttons… Allergen-Free! If you’re looking for a little tiny snack with a big punch reach for a bag of Ian’s Chocolate Chip Cookie Buttons. These tiny chocolate-packed cookies are perfect for the kiddo’s little fingers or for the big kid’s afternoon snacks. I also love that you can pop a few of these crunchy Chocolate Chip Cookie Buttons into your mouth and have a tiny bite-sized cookie to satisfy any sweet tooth, without the super-sized calories! These cookies are also allergy friendly and are now certified peanut free. Each box contains six (6) convenient 1-ounce individual portions which make them perfect for lunch boxes, to sneak into your purse, or for after school snackswhile you’re on the go. All of these allergen-friendly and tasty reasons are why these Ian’s cute-as-a-button cookies are being awarded this week’s Friday Favorite on BeFreeForMe.com. Congratulations! Valentine’s Day is right around the corner and my thoughts keep wandering to sweet treats. Treats that can be enjoyed on a cold winter’s day with a cup of hot tea or cocoa… and yes, treats that can be enjoyed without a worry in the world. And thanks to Cybele’s Free-To-Eat Cookies everyone on a gluten-free diet or those that are concerned with the top 8 allergens – Dairy, Eggs, Wheat, Soy, Peanuts, Tree Nuts, Fish and Shellfish – can enjoy a soft and sweet treat this Valentine’s Day… or any day… worry free. These cookies are made by a mom of a food allergic family, Cybele Pascal (on a side note… Cybele is a remarkable woman! Make sure you check out Cybele’s blog for some delicious recipes and her “Allergen-Free Bakers Handbook” cookbook for some great allergen-free baking tips and recipes!) The cookies are also vegan – and come in three flavors: Chocolate Chunk Brownie, Chocolate Chip, and my favorite, Oatmeal Raisin. Cybele’s Cookies are also baked in a dedicated gluten-free and allergy-friendly facility. For being able to enjoy a super tasty cookie that is worry free when it comes to gluten and allergens, is the reason why I am so very excited to have Cybele’s Free-To-Eat Cookies sponsor this Win-It-Wednesday on BeFreeForMe.com. Two (2) lucky winners will each receive a prize-pack containing one each of Cybele’s Chocolate Chip & Cybele’s Chocolate Chunk Brownie Free-To-Eat Cookies. One (1) winner will be randomly selected from all comments/entries received before Tuesday, February 4, 2014 at 11:59 PM (EST) and one (1) more winner will be randomly selected from all comments/entries received between Wednesday, February 5 and Tuesday, February 11, 2014. So make sure you enter TWO TIMES to win! Yay! It’s Friday again! This week seemed extra long and Friday couldn’t seem to get here fast enough. But finally the end of the week has arrived and it’s once again time for the Friday Favorite on BeFreeForMe.com. This week’s Friday Favorite is another sweet treat. Cybele’s Free-To-Eat Cookies. These cookies are not only gluten-free and vegan – but also free of the top 8 allergens – Dairy, Eggs, Wheat, Soy, Peanuts, Tree Nuts, Fish and Shellfish. They come in three flavors: Chocolate Chunk, Chocolate Chip, and my favorite, Oatmeal Raisin. O.K. – I know by now many of you are also thinking that these cookies must be free of flavor too. But, a-ha, you are wrong my friends. These cookies are soft (like, really, really soft… which I love), moist, full of raisins, chocolate chips & chunks and all the other fixins’. They’re a really treat for those on a gluten-free diet, celiac disease, or with food allergies. But the true taste test is that the non gluten-free and food allergic peeps gobbled them up quick too. These cookies may be free of many things, but they mean business when it comes to being a cookie that doesn’t make you a prisoner to celiac disease and food allergies. Cheers to you Cybele’s Free-To-Eat Cookies! All these tasty reasons are why I am so very thrilled to award Cybele’s Free-To-Eat Cookies this week’s Friday Favorite on BeFreeForMe.com. Congrats! P.S. It seems these cookies are just making their way onto supermarket shelves. Be patience. It will be worth the wait once they arrive! 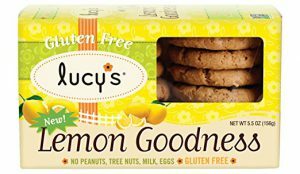 This week’s WIN-It-Wednesday on BeFreeForMe.com is sponsored by Lucy’s Gluten-Free Cookies… one of my favorite gluten-free cookie companies that is founded by one smart cookie herself, Dr. Lucy Gibney. And with only 120 calorie for three (YES 3!) cookies, 0 mg cholesterol, and 0 g tans fat – my most recent favorite dessert can become a tradition all sweet summer long! The flavors of Lucy’s cookies goes beyond the ordinary too. As well as toting a bake sheet of traditional favorites, Lucy’s also offers some tantalizing flavors for the adult palate. Along with the three new flavors – Ginger Snap, Maple Bliss, and Chocolate – they also have an Oatmeal, Chocolate Chip, Cinnamon Thin and Sugar. All of these reasons are why I am so thrilled that Lucy’s Cookies is this week’s WIN-It-Wednesday sponsor on BeFreeForMe.com. A total of four (4) BeFreeForMe members will be selected to win a gift-pack of Lucy’s Cookies. Two winners will be randomly selected from the entries received before Tuesday, July 3, 2012 at 11:59 PM EST, and two more winners will be randomly selected to win from the entries received between Wednesday, July 4 and Tuesday, July 10, 2012 at 11:59 PM. SO – make sure you enter to win two times! This Win-It-Wednesday contest on BeFreeForMe is sponsored a delicious and healthy cookie that is perfect for everyone – including those with food allergies, sensitivities and celiac disease. Not only do I love these cookies, but I also the story behind the cookies. HomeFree cookies are baked with love, and developed by a Mom, Jill Robbins, who understands how important it is for kids with food allergies and sensitivities to feel included during social occasions, where sweet treat are often part of the fun. 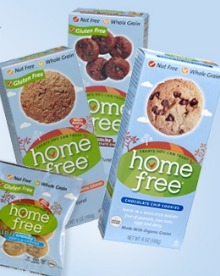 HomeFree cookies come in several varieties which are all free of peanuts, tree nuts, eggs and dairy. Most are also free of gluten and are certified by the GFCO. The varieties that are gluten-free include: Chocolate Chip, Chocolate Chocolate Chip (my favorite! ), Oatmeal, Oatmeal Chocolate Chip, and the Mini Vanilla Cookies, which are also 70% organic and can tout a few awesome awards including being a finalist in the Best New Food category at the Natural Products Expo East 2011 (the 2nd largest natural food show in U.S.) and being the winner of the 2011 Best Snack Award by Shape magazine. The name of these cookies, HomeFree, is so very fitting for what these cookies are – and for what they stand for. HomeFree make cookies are safe, and without problems for those that are on a gluten-free diet, or are concerned with other food allergens or sensitivities. These cookies are made in HomeFree’s own dedicated facility free of peanuts, tree nuts, eggs and dairy with allergen sourced and tested ingredients. HomeFree cookies are also a certified good source of whole grain (trust me… the kids won’t even notice!) Every cookie (or 6 minis) provides at least ½ serving of the 3 recommended daily servings… amazing for a delicious cookie! Also, all HomeFree products are all natural and non-GMO. I also like that these cookies come in “mini” sizes… which are perfect for little hands and pack up so sweet in lunch pails. All these reasons are why I am SO excited that HomeFree Treats is sponsoring the next two week’s WIN-It-Wednesdays on BeFreeForMe.com. Four winners will win a box of HomeFree Gluten-Free Cookies. Two (2) winner will be chosen from all entries received before Tuesday, November 8, 2011 at 11:59 PM EST and another winner will be chosen from all entries received between Wednesday, November 9 and Tuesday November 15, 2011 at 11:59 PM EST. So make sure you enter to win two times! P.S. Want to Buy? Check out the online store at the HomeFree website!